The province is literally a powerhouse when it comes to energy. 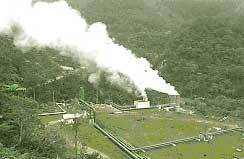 That is because it has vast geothermal fields that are being tapped to produce electricity. The Philippine National Oil Company-Energy Development Corporation (PNOC-EDC) harnesses the underground pressurized steam and supplies it to the power plants of the National Power Corporation (NPC). These facilities are located in the interior town of Valencia, which is adjacent to Dumaguete City. Geothermal power from Valencia is distributed by the NPC to two (2) electric cooperatives (Negros Oriental Electric Cooperatives I and II), which are mandated by law to implement the rural electrification program in the province. NORECO I covers the northern municipalities of Mabinay, Manjuyod, Bindoy, Ayungon, Tayasan, Jimalalud, La Libertad, Guihulngan, and Vallehermoso as well as the cities of Bais and Canlaon. The cooperative is based in Bindoy. It operates two (2) susbstations with a combined capacity of 15 MVA. One (1) substation, with a capacity of 5 MVA, is located in Bindoy. The other, with a 10 MVA capacity, is located in Guihulngan. In 1996, there were already 145 barangays energized out of the 285 potential barangays within targeted for electrification. As a result, at least 22,586 households now have access to electricity. Based on household connections and consumption by commercial and industrial establishments, the peak load of NORECO I was 6,518 KW or about 2,097,995 KWH. Covering the southern portion of the province, NORECO II supplies electricity to the following areas: Dumaguete City, Tanjay City, Bayawan City, Pamplona, Amlan, San Jose, Sibulan, Valencia, Bacong, Dauin, Zamboanguita, Siaton, Sta. Catalina, and Basay. The coverage area has an estimated 126,165 households in 2000, spread over 272 barangays with a land area of 3,181.25 square kilometers or nearly 59 per cent of the total area of the province. As of 1996, NORECO II was able to energize 194 barangays (71.3 per cent of the potential number) and 50,910 households (44 percent of the potential number). The Dumaguete-based cooperative gets power from four (4) substations and one (1) hydroelectric plant with a combined capacity of 45.5 MVA. The largest substation with a combined capacity of 30 MVA is located in Pulantubig, Dumaguete City. The other stations are situated in Tanjay, Siaton, Bayawan and Amlan with capacities of 4.2, 5.0, 5.0 and 1.3 MVA respectively. The hydroelectric plant is located in Amlan. Except for the Amlan substation, all threeutilize a 13.2 KV primary voltage and a 7.62 secondary voltage. NORECO’s present capacity is expected to increase with the ongoing construction of a 3.75 MVA substation in Kalumboyan, Bayawan City and the proposed construction of a 20 MVAA substation in Dumaguete City. The province’s geothermal power plants supply about 30 percent of the total power consumed in the Cebu-Panay-Negros power grid. While the peak load for the entire grid is estimated at 625 MW, the total grid capacity is only 560 MW. The shortfall, however, has been taken up by the geothermal power plants in the island of Leyte, which supplies the electricity via submarine cable linking Leyte-Cebu-Negros and Panay islands. The addition of 200 MW submarine cables on the Leyte-Cebu interconnection in the near future will further boost power sypply in the grid.